The Lane Fleming collection of early pistols and revolvers was one of the best in the country. When Fleming was found dead on the floor of his locked gun room, a Confederate-made Colt-type percussion .36 revolver in his hand, the coroner’s verdict was “death by accident.” But Gladys Fleming had her doubts. Enough at any rate to engage Colonel Jefferson Davis Rand—better known just as Jeff—private detective and a pistol-collector himself, to catalog, appraise, and negotiate the sale of her late husband’s collection. . . .Then you're not making an investigation?" "What in the world is there to investigate?" Rand asked. "I'm just selling a lot of old pistols for the Fleming estate." "I thought Fred Dunmore was doing that." "So did Fred. You're both wrong, though. I am." He got out Goode's letter of authorization and handed it to Rivers, who read it through twice before handing it back. "You see anything in that about Fred Dunmore, or any of the other relatives-in-law?" he asked. "Well, I didn't understand; I'm glad to know what the situation really is." Rivers frowned. "I thought you were making some kind of an investigation, and as I'm the only party making any serious offer to buy those pistols, I wanted to know what there was to investigate." "Do you consider ten thousand dollars to be a serious offer?" Rand asked. "And aren't you forgetting Stephen Gresham and his friends?" Lane Fleming had been found shot in his gunroom amid his collection of 2,500 antique pistols. Ruled an accident, his widow didn't believe it and hired Jefferson Davis Rand, PI and gun expert, to evaluate the collection for sale. Does a good job keeping to the timeframe of the decade the story takes place. Kept the plot moving well. It was nice to read a story by Piper that was NOT science fiction - the only slight SF element was one of the minor characters is a science fiction writer and discusses a story idea with the protagonist. I've long been familiar with H. Beam Piper's science fiction (Little Fuzzy, etc. 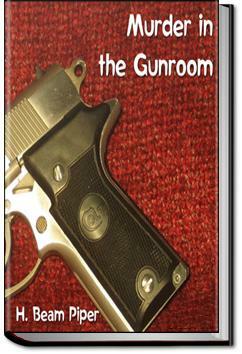 ), but it was only recently that I discovered he also wrote a detective novel, Murder in the Gunroom. Naturally I had to lay hands on this curio.